“Wherever you have friends, that’s your country. This quote brilliantly summarizes my experience of life with and as an exchange student. Half your heart has moved to a new location. warm and basking by the lake. the school districts are cancelling school. at how happy the kids are to have extended vacation. Living in Canada, we’re used to snow. We have the equipment and infrastructure to clear it. As a result, neither as student nor teacher had I experienced a “snow day” before. Sometimes when we lived north in Prince George, BC if it was below -40 C (or F they’re the same at that temperature) the buses wouldn’t run, but schools were still open and teachers were expected to be there. It started snowing Saturday, January 3rd and then it kept snowing Sunday and Monday. 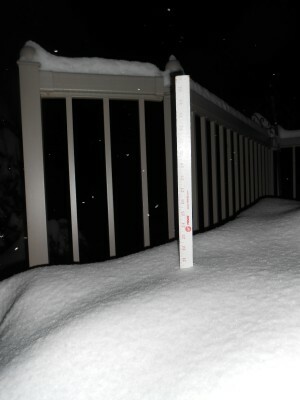 Yesterday (Monday) at 9 pm 20 inches (51 cm) had accumulated on our back deck. The snow clearing machinery couldn’t keep up. The side roads were plugged. Cars were stuck all over the place. Because plows were clearing roads, they couldn’t clear school parking lots. So school was cancelled! Yesterday and today! This summarizes my essential contentment with everything in my life: my new continuing contract at a school I love, opportunity to write and receive feedback from wonderful readers, and my brilliant husband of many, many years and the time we have together. I first discovered this concept when I was an exchange student in Finland, and I realised that even though I was known as ‘The Canadian Evangelist” (because as the lone Canadian in my district, lost in a sea of Americans, I was obliged to be loud and proud about national superiority) I knew that I could quite happily have stayed in Finland. I have experienced this sensation many times since. If you’re content in your skin, and you’re connected to those around you, it doesn’t matter where you are physically. You can live in a tent and be well satisfied. If I am in a room, outbound exchange students find me, whether they know I was one or not. They bounce in their chairs, anticipating their year, and I share their enthusiasm, offer packing tips, and give them hugs. At school, students from far away sit in my class room to discuss ‘life’ in the surreal bubble that is an inbound exchange year. They vent their frustrations, shout their celebrations, observe their confusions. I listen, encourage, bake, and give them hugs. They write when they’re back home, rebound students, about the strange dream that their year abroad becomes in memory. The students my club sent join me at my table at our Rotary meeting upon their return in a numbed stupor. I commiserate about the loss they’re experiencing, the strange sensation of being home, but being far from home. I give them hugs. See that sad face? 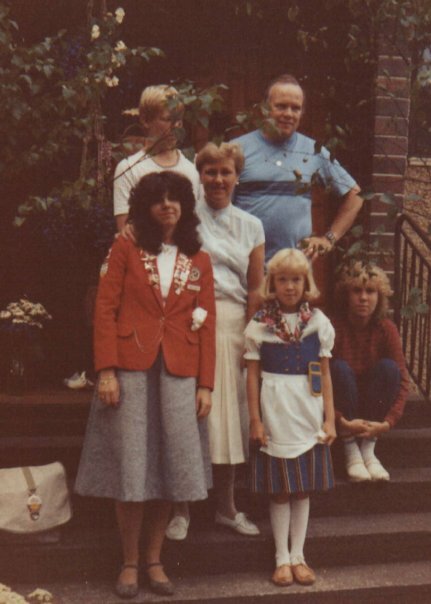 That’s me on my last day in Finland posing with my 4th host family. That is the face of a broken heart. Still miss them and think of them every day! (Thank heaven for Facebook). We are tied by the experience of youth exchange, because it’s all paradox. We feel disconnected and connected. Lost and found. Happy and sad. We each leave pieces of our heart behind in these places that become our second homes, and we never get them back. Hopefully, those we love and leave behind, cherish those pieces for the precious parts of ourselves that they are. Sometimes we are blessed with an opportunity to hold those people against our hearts again, but most of the people who made such a profound impact on our lives, we will never touch again. It is a bitter sweet reality of those who live and love abroad. Welcome home. Welcome to life with pieces missing. We just go on. We find others with missing pieces and we hold each other as we celebrate what we have known. If you know any exchange students returning home this month. Listen to their stories, ask questions about their year, and give them hugs. They really need them right now.